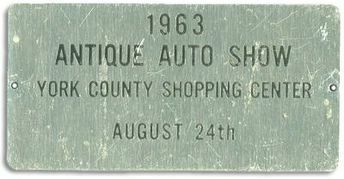 Souvenir from the 1963 Antique Auto Show in the York County Shopping Center in York, Pennsylvania. Cool souvenir even if I'm the only one amused. Chances are that I might have been there for this, since my father had an antique car and attended many of the local meets. The York County Shopping Center was I believe the first suburban center built in the 50's adjacent to the first big suburban development. It remained viable until the 70's when it started to get a bit seedy around the edges. During the 80's Sears bailed out and moved to the new Galleria mall. The center experienced a rebirth in the 90's with extensive renovations and the addition of a grocery store.